Whether you’re looking to have a romantic fondue date night or host a fondue party with family and friends, our Cabot Sharp Cheddar Cheese Fondue recipe is a must. Simple to make and a feast for the taste buds, this fondue recipe makes twelve appetizer servings and provides excellent results with minimal preparation. Keep this recipe on hand because, once you’ve tried it, we think you’ll want to make it over and over again. And please feel free to share this recipe on Facebook, Pinterest, Instagram and Twitter. Be sure to make our Cabot Sharp Cheddar Cheese Fondue for your next fondue night. 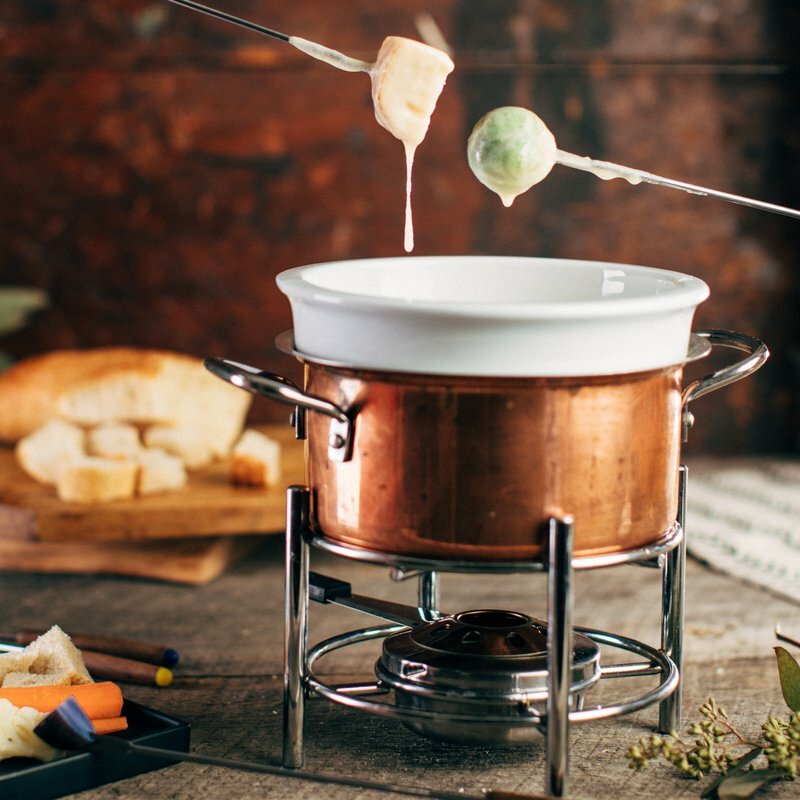 With just a few ingredients, most of which you likely have on hand, this fondue recipe promises easy preparation while delivering fabulous flavor. A dry white wine is one of the few essential ingredients in fondue. Wine is important for providing great flavor, but its tartaric acid is also key in ensuring a stable fondue forms (i.e. it will avoid the cheese clumping together and becoming an unappetizing, stringy mess). You’ll also need garlic cloves, bay leaves, Cabot Sharp Cheddar Shredded Cheese, cornstarch, cold water, and nutmeg. This fondue recipe is wonderful served with large cubes of French or Italian bread and is also divine with a variety of fresh produce – think apple and pear slices, and carrot and zucchini sticks. Delicious! Interested in trying another cheddar cheese fondue? Our Northern Cabot Cheese Fondue makes sixteen servings and uses two of our cheeses - Cabot Pepper Jack cheese and Cabot Sharp Lite75 Cheddar Cheese. With the addition of butter, green onions, shallots, and basil leaves, this fondue recipe is truly savory and satisfying. 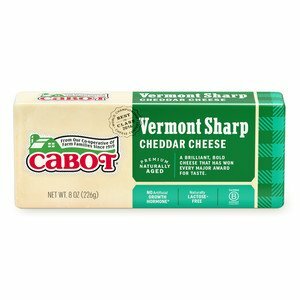 As a cooperative off 800 farm families, Cabot continuously strives to produce the best dairy products around. We hope you enjoyed our cheddar cheese fondue and would greatly appreciate if you would rate and review it after trying it out! PREPARE in enameled or stainless steel saucepan, bring wine, garlic and bay leaves to simmer. Slowly whisk in cheddar and bring back to simmer. STIR together in a small bowl cornstarch and water; whisk into cheese mixture and continue whisking until simmering and slightly thickened. Add nutmeg and remove bay leaves. TRANSFER to fondue pot. Serve with large cubes of French or Italian bread, slices of fresh apple or pear, or fresh vegetables. Recipe courtesy of Chef Jeffrey Weiss. Recipe instructions do not mention vegetable stock which is clearly shown as the first ingredient added in the video... So now I am all ready to make this but do not have all the ingredients. Not pleased. ** Our sincere apologies Sam. Thank you for catching our error. 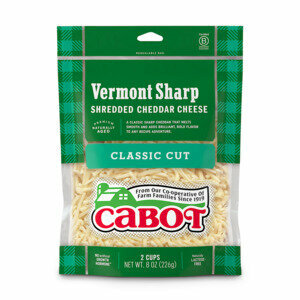 Please email me ggreaves@cabotcheese.coop for a proper thank you. Easy and tasty. My picky family ate every drop. Fabulous! Holiday favorite in our home.